Mold is a severe matter that can become much worse if not taken earnestly. If you suspect mold growth in your home, call (909) 337-7900 for a free estimate on mold testing and mold remediation. Mold that is left untreated can turn into a severe problem faster than you may think. Mold can cause serious health risks and major structural damage to your property. Mold can warp walls, bow floors and ceilings, and single handedly destroy your home’s foundation. Sometimes mold is visible and easy to see, but often you can’t because it lurks behind walls and beneath your floors. Mold stains may look white, black, grey, or even brown, red, blue, or green. The texture of mold may be slimy or moss-like depending on the type of mold you’re dealing with. Some signs that indicate you may need mold testing include cold or flu symptoms that are constant and will not go away – such as irritated eyes and throat, wet or dry cough, skin rashes, and vomiting…just to name a few! DryAgain Water, Mold and Fire Restoration Services’s mold testing Moreno Valley teams will not only provide mold tests – including black mold tests – they will also remove the mold damage from your home. They will make the necessary repairs to your home to keep it from coming back. Mold testing services Moreno Valley also includes follow up home mold testing to make sure mold does not migrate to another area of your home. Mold that is not removed the right way will return again and again. Mold spores travel with ease throughout your house and are carried in on your clothing or just by opening a door or window. Mold requires warmth, moisture, and an organic food source to grow and reproduce. Unless you live in a cold, dry house with no organic materials, mold testing is a good idea! 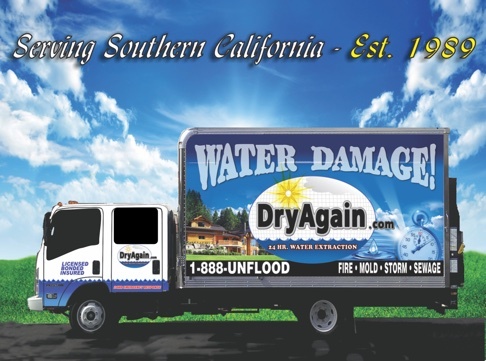 Contact DryAgain Water, Mold and Fire Restoration Services at (909) 337-7900 today to discuss your mold testing needs. At DryAgain Water, Mold and Fire Restoration Services we are available day and night for all of your mold testing needs! Our mold testing company Moreno Valley includes a full inspection of the home and a thorough plan comprises of the following services: air purification, mold removal and any complete rehabilitation of the area damaged by mold. We will determine the exact source of the mold so it can be fixed, cleaned up, and preventative measures can be put into place to prevent it from happening again. This could mean anything from fixing a roof, working on plumbing issues, or even fixing gutters which can cause a lot of mold damage. The signs of mold include cold and allergy symptoms like coughing, sneezing, watery eyes, rashes, a musty smell, and staining on walls, floors, furniture, or other objects. These signs will help determine if mold testing Moreno Valley, California is needed. DryAgain Water, Mold and Fire Restoration Services may also recommend improvements to your air quality by using a dehumidifier. Fans can be used to encourage air circulation. You would be pleasantly surprised by how much these small steps can help when it comes to keeping mold at bay. Our courteous mold testing company Moreno Valley teams are very sensitive to these issues. All of our mold test Moreno Valley customers are treated with the respect and dignity they deserve because we know mold damage issues often occur without your knowledge. DryAgain Water, Mold and Fire Restoration Services’s mold testing employees will also return to make sure mold growth has not come back after mold remediation is complete. Our mold testing services are guaranteed, and all of our mold test Moreno Valley, California employees are fully trained and certified. Call us today at (909) 337-7900 to discuss your mold tests. We also test for toxic black mold. We look forward to speaking with you! Which Mold Testing Company Moreno Valley Is Right For Your Home? Mold damage gets worse over time so time is of the essence when it comes to mold damage. Mold damage can cause long-term problems to your home and to your health. Again, the signs of mold damage include cold or allergy symptoms that you can’t seem to shake, mold stains, and a musty smell. This is why DryAgain Water, Mold and Fire Restoration Services is available day and night to begin your mold testing. Our mold damage testing company Moreno Valleyis available 24 hours a day, 365 days a year. We provide a detailed mold test report that includes the mold levels in your home, where they occur, and what needs to be done to fix them. We will make suggestions to help you keep your home from becoming a magnet for mold. For areas that are consistently damp, we recommend a dehumidifier. We suggest fans and a good ventilation system because these things can go a long way in mold prevention. Our home mold testing service Moreno Valley team is fully certified and insured so you can rest assure the job is done correctly the first time. Our mold testing education continues beyond that of most other mold testing companies. We are constantly looking for ways to improve ourselves and use only the latest technology to make mold testing quick and seamless. All mold testing Moreno Valley customers are treated with absolute dignity. Mold damage occurs to almost everyone at some point in their lives because mold exists virtually everywhere. Our job is to test mold and provide a mold removal plan, end of story. Our mold testing services are completely guaranteed. Contact us today at (909) 337-7900 today. Our courteous home mold testing Moreno Valley customer service teams await your call!